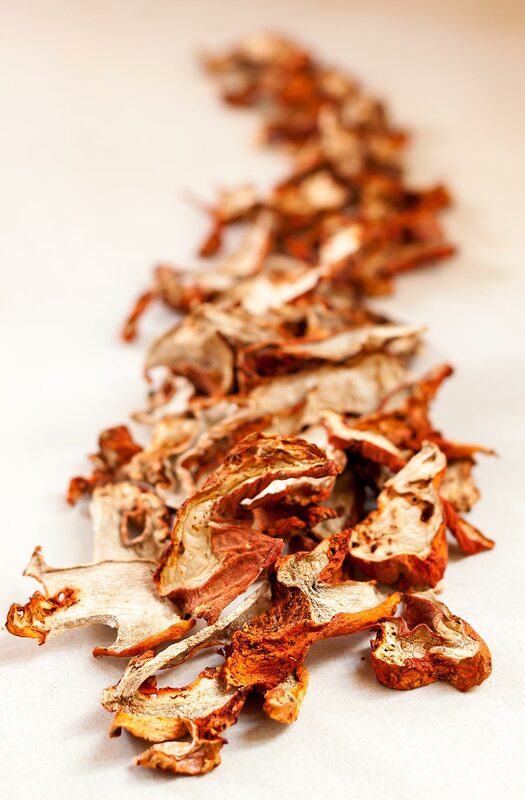 Lobster mushrooms are one of the most distinctive of edible wild mushrooms. Some say that they get their unusual name from their flavor, which is reminiscent of shellfish. It seems more likely that their bright orange-red exterior and snowy white flesh (which looks a lot like cooked lobster) are the source of their colorful appellation. The lobster mushroom is something of an oddity in the mushroom world, which certainly has more than its share of unusual characters. 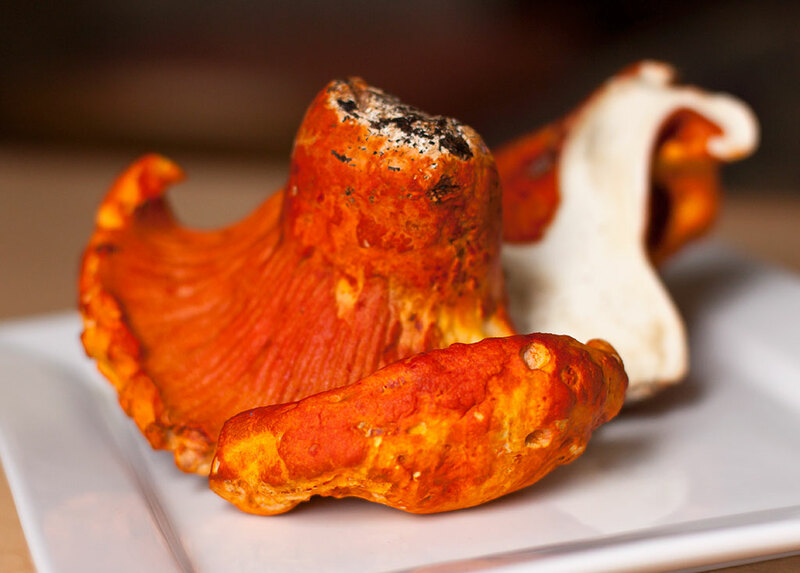 The lobster mushroom forms when the fungus Hypomyces lactifluorum attacks and parasitizes a host mushroom, covering the entire exterior portion with the brilliant orange skin that is the lobster mushroom’s most visually distinctive trait. As fascinating as this process might be, the lobster mushroom is prized for its choice edibility, especially when it’s young and fresh. But the lobster also dries exceptionally well, allowing it to be stored for many months with no refrigeration. When rehydrated, its color and pleasantly firm texture make it an excellent candidate for winter soups and stews. 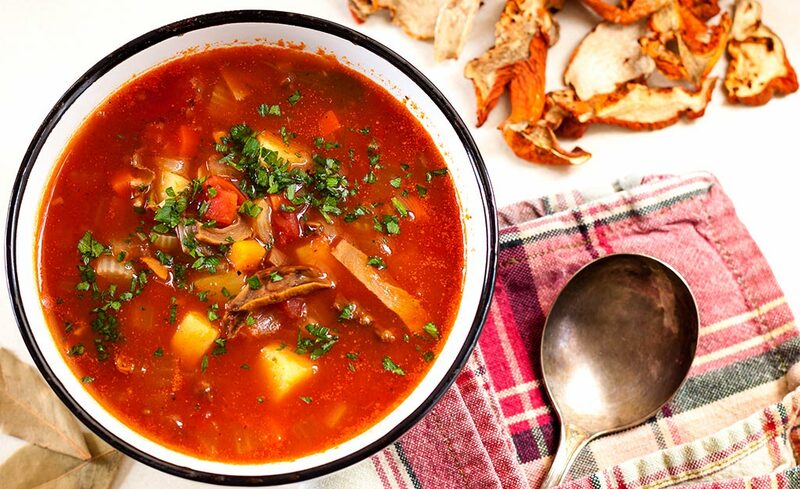 The mushroom’s seafood-like aroma and flavor make it a perfect choice for this unique twist on the classic Manhattan Clam Chowder. Lobster mushrooms take the place of the shellfish, and their distinctive flavor, color and texture make a remarkably apt substitute for the clams. In fact, you might just want to skip the seafood and give this deliciously spicy soup a permanent place in your menu rotation. 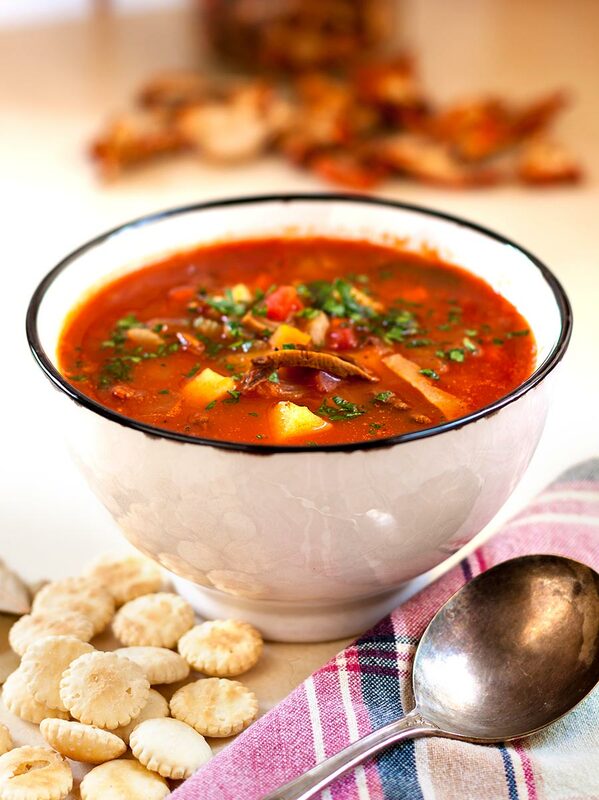 Manhattan-style chowder is distinctly different from the creamy chowders found in New England. This tomato-based version is a direct descendent of the traditional seafood soups brought to this country by immigrant fishermen from Italy, Portugal and France a century or more ago. Our version has a spicy kick that comes from a generous pinch of crushed red peppers. It’s just the thing to chase away the chill of winter. Oyster crackers for serving, if desired. Place the dried mushroom into a bowl and cover with the hot water. Soak for 20 – 30 minutes or until the mushrooms are softened and pliable. Drain, reserving the soaking liquid. Rinse the rehydrated mushrooms thoroughly under running water to remove any residual grit or forest debris. Drain again, pat dry and chop coarsely. Heat the oil in a large pot over medium heat. Add the onion, carrots, celery, garlic, and crushed red pepper and cook, stirring occasionally, until soft, about 10 minutes. Stir in the tomato paste and continue to cook, stirring, for another minute or two. Tie the parsley and fresh thyme together with a piece of kitchen string. Add to the pot along with the bay leaf and chopped mushrooms. Pour in the stock and reserved mushroom liquid and bring to a boil. Lower the heat to a simmer, cover and cook for 15 minutes. Add the diced potatoes and cook for an additional 15 minutes or until the potatoes are tender. Stir in the diced tomatoes and juice. Cover and return to a low simmer and cook for a few more minutes. If the soup is too thick, add more stock until the desired consistency is reached. Remove from the heat and discard the herb bundle and bay leaf. Taste and adjust the seasoning with salt and pepper as needed. Ladle into bowls and sprinkle with the chopped parsley. Serve with oyster crackers on the side if desired.